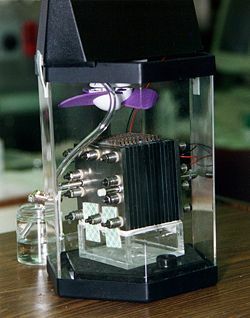 Methanol fuel cell. The actual fuel cell stack is the layered bi-cubic structure in the center of the image. 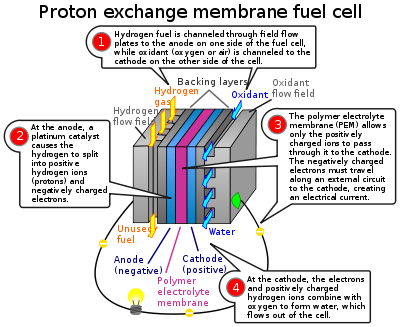 A fuel cell is an electrochemical device that converts chemical energy into electricity. It is made up of two electrodes, each coated with a catalyst, separated by an electrolyte. During operation, the fuel cell consumes reactants, consisting of a fuel (such as hydrogen) and an oxidant (such as oxygen), and releases waste products (such as water and carbon dioxide). Electrons released by the fuel at one electrode travel though an external circuit to the other electrode, thereby producing electrical power. Fuel cells can operate virtually continuously as long as the necessary flows are maintained. As power sources, fuel cells are useful for remote locations, such as remote weather stations, large parks, and rural areas. They are also valuable for spacecraft and certain military applications. A fuel cell system running on hydrogen can be compact and lightweight, with no major moving parts. In a recent application, known as micro combined heat and power, fuel cells are used to provide electricity for homes, offices, and factories, while the waste heat is used to produce hot air and water. In addition, excess power may be sold back to the grid. The principle of the fuel cell was discovered by German scientist Christian Friedrich Schönbein in 1838 and published in the January 1839 edition of the "Philosophical Magazine." Based on this work, the first fuel cell was developed by Welsh scientist Sir William Robert Grove in 1845. Another source, however, reports that Grove invented the fuel cell in 1839. The fuel cell he made used materials similar to today's phosphoric-acid fuel cell. In 1955, W. Thomas Grubb, a chemist working for the General Electric Company (GE), further modified the original fuel cell design by using a sulfonated polystyrene ion-exchange membrane as the electrolyte. Three years later, another GE chemist, Leonard Niedrach, devised a way of depositing platinum onto the membrane, which served as catalyst for the necessary hydrogen oxidation and oxygen reduction reactions. This became known as the "Grubb-Niedrach fuel cell." GE went on to develop this technology with NASA and McDonnell Aircraft, leading to its use during Project Gemini. This was the first commercial use of a fuel cell. It wasn't until 1959 that British engineer Francis Thomas Bacon successfully developed a 5 kW stationary fuel cell. In 1959, a team led by Harry Ihrig built a 15 kW fuel cell tractor for Allis-Chalmers which was demonstrated across the U.S. at state fairs. This system used potassium hydroxide as the electrolyte and compressed hydrogen and oxygen as the reactants. Later in 1959, Bacon and his colleagues demonstrated a practical five-kilowatt unit capable of powering a welding machine. In the 1960s, Pratt and Whitney licensed Bacon's U.S. patents for use in the U.S. space program to supply electricity and drinking water (hydrogen and oxygen being readily available from the spacecraft tanks). United Technology Corp.'s UTC Power subsidiary was the first company to manufacture and commercialize a large, stationary fuel cell system for use as a co-generation power plant in hospitals, universities and large office buildings. UTC Power continues to market this fuel cell as the PureCell 200, a 200 kW system. UTC Power continues to be the sole supplier of fuel cells to NASA for use in space vehicles, having supplied the Apollo missions, and currently the Space Shuttle program, and is developing fuel cells for automobiles, buses, and cell phone towers; the company has demonstrated the first fuel cell capable of starting under freezing conditions with its proton exchange membrane automotive fuel cell. Diagram of a low-temperature proton exchange membrane fuel cell (PEMFC). Components include: A bipolar plate as electrode, with in-milled gas channel structure, fabricated from conductive plastics (enhanced with carbon nanotubes for more conductivity); porous carbon papers; reactive layer, usually on the polymer membrane applied; polymer membrane. In the archetypal hydrogen–oxygen proton exchange membrane fuel cell (PEMFC) design, a proton-conducting polymer membrane (the electrolyte) separates the anode and cathode sides. Each electrode is coated on one side with a catalyst that is typically a platinum group metal or alloy. This setup was called a "solid polymer electrolyte fuel cell" (SPEFC) in the early 1970s, before the proton exchange mechanism was well-understood. In this cell, hydrogen diffuses to the anode catalyst where it dissociates into protons (hydrogen ions) and electrons. (These protons often react with oxidants causing them to become what are commonly referred to as multi-facilitated proton membranes (MFPM).) The protons are conducted through the membrane to the cathode, but the electrons (which are not conducted by the membrane) travel through an external circuit, supplying electric power. On the cathode catalyst, oxygen molecules react with the electrons (that have traveled through the external circuit) and protons to form water. In this example, the only waste product is water, in either the liquid or vapor form. In addition to pure hydrogen, fuels used in fuel cells include hydrocarbons, methanol, and chemical hydrides. The waste products with these types of fuel are carbon dioxide and water. In addition to oxygen, oxidants used in fuel cells include chlorine and chlorine dioxide. The electrode plates are usually made of metal (such as nickel) or carbon nanotubes, and are coated with a catalyst (such as platinum, nano iron powders, or palladium) for higher efficiency. Carbon paper separates them from the electrolyte. The electrolyte could be ceramic or an artificial membrane. To deliver the desired amount of energy, the fuel cells can be combined in series and parallel circuits, where series yield higher voltage, and parallel allows a stronger current to be drawn. Such a design is called a fuel cell stack. Further, the cell surface area can be increased, to allow stronger current from each cell. Costs. In 2002, typical cells had a catalyst content of US$1000 per kilowatt of electric power output. In 2008 UTC Power has 400kw Fuel cells for $1,000,000 per 400kW installed costs. The goal is to reduce the cost in order to compete with current market technologies including gasoline internal combustion engines. Many companies are working on techniques to reduce cost in a variety of ways including reducing the amount of platinum needed in each individual cell. Ballard Power Systems have experiments with a catalyst enhanced with carbon silk which allows a 30 percent reduction (1 mg/cm² to 0.7 mg/cm²) in platinum usage without reduction in performance. Monash University, Melbourne, uses PEDOT instead of platinum. The production costs of the PEM (proton exchange membrane). The Nafion membrane currently costs €400/m². The ITM Power membrane (a hydrocarbon polymer) is a new patent that may result in significant price reductions per square meter. in 2005 Ballard Power Systems announced that its fuel cells will use Solupor, a porous polyethylene film patented by DSM. Durability, service life, and special requirements for some type of cells. Stationary applications typically require more than 40,000 hours of reliable operation at a temperature of -35 °C to 40 °C, while automotive fuel cells require a 5,000 hour lifespan (the equivalent of 150,000 miles) under extreme temperatures. Automotive engines must also be able to start reliably at -30 °C and have a high power to volume ratio (typically 2.5 kW per liter). Limited carbon monoxide tolerance of the anode. Fuel cells do not store electrical energy but produce it as long as they are supplied with reactants, which must be replenished. By contrast, electrochemical batteries store electrical energy chemically, in a closed system. Additionally, the electrodes in a battery react and change as the battery is charged or discharged, but a fuel cell's electrodes are catalytic and relatively stable. For a hydrogen cell operating at standard conditions with no reactant leaks, the efficiency is equal to the cell voltage divided by 1.48 V, based on the enthalpy, or heating value, of the reaction. For the same cell, the second law efficiency is equal to cell voltage divided by 1.23 V. (This voltage varies with fuel used, and quality and temperature of the cell.) The difference between these number represents the difference between the reaction's enthalpy and Gibbs free energy. This difference always appears as heat, along with any losses in electrical conversion efficiency. Fuel cells do not operate on a thermal cycle. As such, they are not constrained, as combustion engines are, in the same way by thermodynamic limits, such as Carnot cycle efficiency. At times this is misrepresented by saying that fuel cells are exempt from the laws of thermodynamics, because most people think of thermodynamics in terms of combustion processes (enthalpy of formation). The laws of thermodynamics also hold for chemical processes (Gibbs free energy) like fuel cells, but the maximum theoretical efficiency is higher (83 percent efficient at 298K ) than the Otto cycle thermal efficiency (60 percent for compression ratio of 10 and specific heat ratio of 1.4). Comparing limits imposed by thermodynamics is not a good predictor of practically achievable efficiencies. Also, if propulsion is the goal, electrical output of the fuel cell has to still be converted into mechanical power with the corresponding inefficiency. In reference to the exemption claim, the correct claim is that the "limitations imposed by the second law of thermodynamics on the operation of fuel cells are much less severe than the limitations imposed on conventional energy conversion systems." Consequently, they can have very high efficiencies in converting chemical energy to electrical energy, especially when they are operated at low power density, and using pure hydrogen and oxygen as reactants. For a fuel cell operated on air (rather than bottled oxygen), losses due to the air supply system must also be taken into account. This refers to the pressurization of the air and humidifying it. This reduces the efficiency significantly and brings it near to that of a compression ignition engine. Furthermore fuel cell efficiency decreases as load increases. The tank-to-wheel efficiency of a fuel cell vehicle is about 45 percent at low loads and shows average values of about 36 percent when a driving cycle like the NEDC (New European Driving Cycle) is used as test procedure. The comparable NEDC value for a Diesel vehicle is 22 percent. It is also important to take losses due to fuel production, transportation, and storage into account. Fuel cell vehicles running on compressed hydrogen may have a power-plant-to-wheel efficiency of 22 percent if the hydrogen is stored as high-pressure gas, and 17 percent if it is stored as liquid hydrogen. Fuel cells cannot store energy like a battery, but in some applications, such as stand-alone power plants based on discontinuous sources such as solar or wind power, they are combined with electrolyzers and storage systems to form an energy storage system. The overall efficiency (electricity to hydrogen and back to electricity) of such plants (known as round-trip efficiency) is between 30 and 50 percent, depending on conditions. While a much cheaper lead-acid battery might return about 90 percent, the electrolyzer/fuel cell system can store indefinite quantities of hydrogen, and is therefore better suited for long-term storage. Solid-oxide fuel cells produce exothermic heat from the recombination of the oxygen and hydrogen. The ceramic can run as hot as 800 degrees Celsius. This heat can be captured and used to heat water in a micro combined heat and power (m-CHP) application. When the heat is captured, total efficiency can reach 80-90 percent. CHP units are being developed today for the European home market. Type 212 submarine with fuel cell propulsion of the German Navy in dock. Fuel cells are very useful as power sources in remote locations, such as spacecraft, remote weather stations, large parks, rural locations, and in certain military applications. A fuel cell system running on hydrogen can be compact and lightweight, and have no major moving parts. Because fuel cells have no moving parts and do not involve combustion, in ideal conditions they can achieve up to 99.9999% reliability. This equates to around one minute of down time in a two year period. A new application is micro combined heat and power, which is cogeneration for family homes, office buildings and factories. This type of system generates constant electric power (selling excess power back to the grid when it is not consumed), and at the same time produces hot air and water from the waste heat. A lower fuel-to-electricity conversion efficiency is tolerated (typically 15-20 percent), because most of the energy not converted into electricity is utilized as heat. Some heat is lost with the exhaust gas just as in a normal furnace, so the combined heat and power efficiency is still lower than 100 percent, typically around 80 percent. In terms of exergy however, the process is inefficient, and one could do better by maximizing the electricity generated and then using the electricity to drive a heat pump. Phosphoric-acid fuel cells (PAFC) comprise the largest segment of existing CHP products worldwide and can provide combined efficiencies close to 90 percent (35-50 percent electric + remainder as thermal). Molten-carbonate fuel cells have also been installed in these applications, and solid-oxide fuel cell prototypes exist. 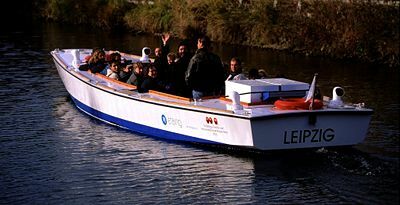 The world's first certified Fuel Cell Boat (HYDRA), in Leipzig/Germany. Since electrolyzer systems do not store fuel in themselves, but rather rely on external storage units, they can be successfully applied in large-scale energy storage, rural areas being one example. In this application, batteries would have to be largely oversized to meet the storage demand, but fuel cells only need a larger storage unit (typically cheaper than an electrochemical device). One such pilot program is operating on Stuart Island in Washington State. There the Stuart Island Energy Initiative has built a complete, closed-loop system: Solar panels power an electrolyzer which makes hydrogen. The hydrogen is stored in a 500 gallon tank at 200 PSI, and runs a ReliOn fuel cell to provide full electric back-up to the off-the-grid residence. The SIEI website gives extensive technical details. The world's first Fuel Cell Ship HYDRA used an AFC system with 6.5 kW net output. Notebook computers for applications where AC charging may not be available for weeks at a time. Portable charging docks for small electronics (for example, a belt clip that charges your cell phone or PDA). Smartphones with high power consumption due to large displays and additional features like GPS might be equipped with micro fuel cells. The first public hydrogen refueling station was opened in Reykjavík, Iceland in April 2003. This station serves three buses built by DaimlerChrysler that are in service in the public transport net of Reykjavík. The station produces the hydrogen it needs by itself, with an electrolyzing unit (produced by Norsk Hydro), and does not need refilling: all that enters is electricity and water. Royal Dutch Shell is also a partner in the project. The station has no roof, in order to allow any leaked hydrogen to escape to the atmosphere. The GM 1966 Electrovan was the automotive industry's first attempt at an automobile powered by a hydrogen fuel cell. The Electrovan, which weighed more than twice as much as a normal van, could travel up to 70mph for 30 seconds. The 2001 Chrysler Natrium used its own on-board hydrogen processor. It produces hydrogen for the fuel cell by reacting sodium borohydride fuel with Borax, both of which Chrysler claimed were naturally occurring in great quantity in the United States. The hydrogen produces electric power in the fuel cell for near-silent operation and a range of 300 miles without impinging on passenger space. Chrysler also developed vehicles which separated hydrogen from gasoline in the vehicle, the purpose being to reduce emissions without relying on a nonexistent hydrogen infrastructure and to avoid large storage tanks. In 2005, the British firm Intelligent Energy produced the first ever working hydrogen run motorcycle called the ENV (Emission Neutral Vehicle). The motorcycle holds enough fuel to run for four hours, and to travel 100 miles in an urban area, at a top speed of 50 miles per hour. Honda is also going to offer fuel-cell motorcycles. 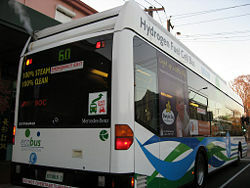 A hydrogen fuel cell public bus accelerating at traffic lights in Perth, Western Australia. There are numerous prototype or production cars and buses based on fuel cell technology being researched or manufactured. Research is ongoing at a variety of motor car manufacturers. Honda has announced the release of a hydrogen vehicle in 2008. Type 212 submarines use fuel cells to remain submerged for weeks without the need to surface. Boeing researchers and industry partners throughout Europe are planning to conduct experimental flight tests in 2007 of a manned airplane powered only by a fuel cell and lightweight batteries. The Fuel Cell Demonstrator Airplane research project was completed recently and thorough systems integration testing is now under way in preparation for upcoming ground and flight testing. The Boeing demonstrator uses a Proton Exchange Membrane (PEM) fuel cell/lithium-ion battery hybrid system to power an electric motor, which is coupled to a conventional propeller. Not all geographic markets are ready for SOFC powered m-CHP appliances. Currently, the regions that lead the race in Distributed Generation and deployment of fuel cell m-CHP units are the EU and Japan. Electrochemical extraction of energy from hydrogen via fuel cells is an especially clean method of meeting power requirements, but not an efficient one, due to the necessity of adding large amounts of energy to either water or hydrocarbon fuels in order to produce the hydrogen. Additionally, during the extraction of hydrogen from hydrocarbons, carbon monoxide is released. Although this gas is artificially converted into carbon dioxide, such a method of extracting hydrogen remains environmentally injurious. It must however be noted that regarding the concept of the hydrogen vehicle, burning/combustion of hydrogen in an internal combustion engine (IC/ICE) is often confused with the electrochemical process of generating electricity via fuel cells (FC) in which there is no combustion (though there is a small byproduct of heat in the reaction). Both processes require the establishment of a hydrogen economy before they may be considered commercially viable, and even then, the aforementioned energy costs make a hydrogen economy of questionable environmental value. Hydrogen combustion is similar to petroleum combustion, and like petroleum combustion, still results in nitrogen oxides as a by-product of the combustion, which lead to smog. Hydrogen combustion, like that of petroleum, is limited by the Carnot efficiency, but is completely different from the hydrogen fuel cell's chemical conversion process of hydrogen to electricity and water without combustion. Hydrogen fuel cells emit only water during use, while producing carbon dioxide emissions during the majority of hydrogen production, which comes from natural gas. Direct methane or natural gas conversion (whether IC or FC) also generate carbon dioxide emissions, but direct hydrocarbon conversion in high-temperature fuel cells produces lower carbon dioxide emissions than either combustion of the same fuel (due to the higher efficiency of the fuel cell process compared to combustion), and also lower carbon dioxide emissions than hydrogen fuel cells, which use methane less efficiently than high-temperature fuel cells by first converting it to high-purity hydrogen by steam reforming. Although hydrogen can also be produced by electrolysis of water using renewable energy, at present less than 3% of hydrogen is produced in this way. Hydrogen is an energy carrier, and not an energy source, because it is usually produced from other energy sources via petroleum combustion, wind power, or solar photovoltaic cells. Hydrogen may be produced from subsurface reservoirs of methane and natural gas by a combination of steam reforming with the water gas shift reaction, from coal by coal gasification, or from oil shale by oil shale gasification. Electrolysis, which requires electricity, and high-temperature electrolysis/thermochemical production, which requires high temperatures (ideal for nuclear reactors), are two primary methods for the extraction of hydrogen from water. As of 2005, 49.7 percent of the electricity produced in the United States comes from coal, 19.3 percent comes from nuclear, 18.7 percent comes from natural gas, 6.5 percent from hydroelectricity, 3% from petroleum and the remaining 2.8% mostly coming from geothermal, solar and biomass. When hydrogen is produced through electrolysis, the energy comes from these sources. Though the fuel cell itself will only emit heat and water as waste, pollution is often caused when generating the electricity required to produce the hydrogen that the fuel cell uses as its power source (for example, when coal, oil, or natural gas-generated electricity is used). This will be the case unless the hydrogen is produced using electricity generated by hydroelectric, geothermal, solar, wind or other clean power sources (which may or may not include nuclear power, depending on one's attitude to the nuclear waste byproducts); hydrogen is only as clean as the energy sources used to produce it. A holistic approach has to take into consideration the impacts of an extended hydrogen scenario, including the production, the use and the disposal of infrastructure and energy converters. Nowadays low temperature fuel cell stacks proton exchange membrane fuel cell (PEMFC), direct methanol fuel cell (DMFC) and phosphoric acid fuel cell (PAFC) make extensive use of catalysts. Impurities poison or foul the catalysts (reducing activity and efficiency), thus higher catalyst densities are required. Limited reserves of platinum quicken the synthesis of an inorganic complex very similar to the catalytic iron-sulfur core of bacterial hydrogenase to step in. Although platinum is seen by some as one of the major "showstoppers" to mass market fuel cell commercialization companies, most predictions of platinum running out and/or platinum prices soaring do not take into account effects of thrifting (reduction in catalyst loading) and recycling. Recent research at Brookhaven National Laboratory could lead to the replacement of platinum by a gold-palladium coating which may be less susceptible to poisoning and thereby improve fuel cell lifetime considerably. Current targets for a transport PEM fuel cells are 0.2 g/kW Pt—which is a factor of 5 decrease over current loadings—and recent comments from major original equipment manufacturers (OEMs) indicate that this is possible. Also it is fully anticipated that recycling of fuel cells components, including platinum, will kick-in. High-temperature fuel cells, including molten carbonate fuel cells (MCFC's) and solid oxide fuel cells (SOFC's), do not use platinum as catalysts, but instead use cheaper materials such as nickel and nickel oxide, which are considerably more abundant (for example, nickel is used in fairly large quantities in common stainless steel). August 2005: Georgia Institute of Technology researchers use triazole to raise the operating temperature of PEM fuel cells from below 100 °C to over 125 °C, claiming this will require less carbon-monoxide purification of the hydrogen fuel. 2006: Staxon introduced an inexpensive OEM fuel cell module for system integration. In 2006, Angstrom Power, a British Columbia based company, began commercial sales of portable devices using proprietary hydrogen fuel cell technology, trademarked as "micro hydrogen." ↑ Karim Nice and Jonathan Strickland, "How Fuel Cells Work," HowStuffWorks.com. Retrieved September 3, 2008. ↑ UTC Power, The PureCell 200—Product Overview. Retrieved September 4, 2008. ↑ SpaceAholic, Apollo Space Program Hydrogen Fuel Cells. Retrieved September 4, 2008. ↑ LEMTA, Our fuel cells. Retrieved September 3, 2008. ↑ S.G. Meibuhr, Electrochim. Acta. 11 (1966): 1301. ↑ James Larminie, Fuel Cell Systems Explained, 2nd ed. (Chichester, West Sussex, UK: J. Wiley, ISBN 9780470848579). ↑ Fuel Cells Work, Ballard Power Systems: Commercially Viable Fuel Cell Stack Technology Ready by 2010. Retrieved September 3, 2008. ↑ Anna Salleh, Australian researchers pioneer cheaper fuel cells, ABC. Retrieved September 3, 2008. ↑ European Patent Office, Electrolytic Membrane, Method of Manufacturing it and Use. Retrieved September 3, 2008. ↑ Ballard Uses Solupor. ECN. Retrieved September 3, 2008. ↑ Roads 2 HyCom, Water and Air Management for Fuel Cells. Retrieved September 3, 2008. ↑ World Energy Council, Fuel Cell efficiency. Retrieved September 4, 2008. ↑ MIT, About Fuel Cells. Retrieved September 4, 2008. ↑ European Fuel Cell Forum, Efficiency of Hydrogen PEFC, Diesel-SOFC-Hybrid and Battery Electric Vehicles. Retrieved September 4, 2008. ↑ Christopher P. Garcia, Bei-jiann Chang, Donald W. Johnson, David J. Bents, Vincent J. Scullin, and Ian J. Jakupca, Round Trip Energy Efficiency of NASA Glenn Regenerative Fuel Cell System, NASA Preprint. Retrieved September 4, 2008. 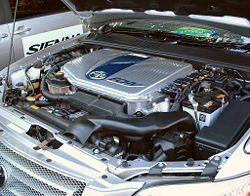 ↑ Fuel Cells, Fuel Cell Basics: Benefits. Retrieved September 4, 2008. ↑ UTC Power, Fuel Cell Efficiency. Retrieved September 4, 2008. ↑ Stuart Island Energy Initiative, Home page. Retrieved September 4, 2008. ↑ Danny Hakim, An Electrovan, Not an Edsel, New York Times, November 17, 2002, page 3.2. ↑ Allpar, natrium. Retrieved September 4, 2008. ↑ Allpar, Chrysler Fuel Cell Vehicles. Retrieved September 4, 2008. ↑ Intelligent Energy, The ENV Bike. Retrieved September 4, 2008. ↑ Honda, Honda Develops Fuel Cell Scooter Equipped with Honda FC Stack. Retrieved September 4, 2008. ↑ Eric Briant, Honda to offer fuel-cell motorcycle. Retrieved September 4, 2008. ↑ CBC News, Honda readies fuel-cell car for 2008 launch. Retrieved September 4, 2008. ↑ Ceramic Fuel Cells Limited, m-CHP. Retrieved September 4, 2008. ↑ Energy Information Administration, EIA - Electricity Data, Analysis, Surveys. Retrieved September 4, 2008. ↑ Anca Faur-Ghenciu, Fuel Processing Catalysts for Hydrogen Reformate Generation for PEM Fuel Cells, FuelCell Magazine. Retrieved September 4, 2008. ↑ Stu Borman, Iron-Sulfur Core Assembled, Chemical & Engineering News 83 (7): 11. Retrieved September 4, 2008. ↑ Johnson, R. Colin, Gold is key to ending platinum dissolution in fuel cells, EETimes.com. Retrieved September 4, 2008. ↑ Georgia Institute of Technology, Chemical Could Revolutionize Polymer Fuel Cells. Retrieved September 4, 2008. ↑ Angstrom Power, Home page. Retrieved September 4, 2008. 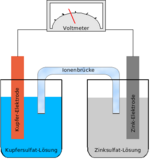 ↑ Micro-Fuel Cell Blog, Home page. Retrieved September 4, 2008. Harper, Gavin D.J. 2008. Fuel Cell Projects for the Evil Genius. New York, NY: McGraw-Hill. ISBN 0071496599. Mench, Matthew M. 2008. Fuel Cell Engines. Hoboken, NJ: John Wiley & Sons. ISBN 0471689580. Spiegel, Colleen. 2007. Designing and Building Fuel Cells. New York, NY: McGraw-Hill. ISBN 0071489770. Ponaganset's Fuel Cell Education Initiative Classes. Thermodynamics of electrolysis of water and hydrogen fuel cells. "New catalyst boosts hydrogen as transport fuel". By Alok Jha. August 21, 2008. The Guardian. This page was last modified on 15 May 2017, at 20:59.